Wedge-tailed eagles, habitat, diet and food sources in Australia. Birds of prey, Aquila audax, Australian study. Big Volcano Feature Story, bird watchers, bird observers. Want the chance to see Wedge tailed eagles on your next holiday? Try these places to stay. Tweed Valley Wildlife Carers Inc. Birds of prey: Wedge-tailed eagles (Aquila audax), Australian study of habitat, diet and food sources in Australia. The Wedge-tailed eagle, Aquila audax, is the largest bird of prey in Australia. With a wing-span of up to 2.5 metres, they soar and glide majestically in the air currents. They belong to the group of birds which also includes the golden eagle and other impressive birds. The wedge-tailed eagle is protected by the National Parks and Wildlife Service. In earlier times these eagles were regarded as vermin and farmers were encouraged to kill them. In one year it was estimated that 30,000 wedge-tailed eagles were killed. It is now illegal to kill, trap, poison or interfere with them in any way. Protection of the bird followed both widespread public concern for its safety, and increasing scientific evidence that the bird does very little harm to livestock. Click on the photo to hear the call. 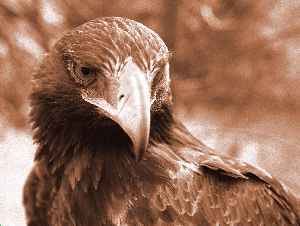 The wedge-tailed eagle is distributed over the entire Australian continent. It is more commonly found in open woodland areas which have a good grassy ground cover. These areas have expanded since the introduction to livestock, when much of the inland was thinned of timber. Open woodland areas are ideal hunting areas for eagles. Between 80% and 90% of an eagle's food is made up of ground living animals. Naturally, an eagle can more easily find these animals in open country. Wedge-tailed eagles have a varied diet which includes rabbits, hares, kangaroos, wallabies, snakes and lizards, ravens and crows, foxes and feral cats, possums and sheep. When available, rabbits form the major food of the eagle, accounting for about 43% of all prey in a number of areas that have been studied. They probably help control these pests in grazing areas. Hares usually represent the next most important food type. In drier areas where they do not occur young wallabies and kangaroos are usually second in importance as food. Snakes and lizards are also eaten and in some areas take up 18% of the intake. Crows and ravens may comprise 5 to 8%, while foxes and feral cats are a minor snack, making up only about 3 to 3.5%. Eagles are known to eat sheep. However, studies on eagle diets indicate that sheep account for less than 9% in areas where sheep grazing is widespread. In addition it is likely that the eagles were feeding on dead or dying stock as carrion is an important part of their food. One study has been able to tell whether dead lambs died of illness or predators. It showed that foxes and crows are more important predators than eagles. Less than 2% of all sheep taken had been attacked by eagles. Real economic losses of healthy lambs killed by eagles are negligible. Wedge-tails construct a huge nest in large trees usually with a commanding view. Several nests are active in the Northern Rivers area and the species appears to be increasing generally as a result of community awareness and increased protection. Under the National Parks and Wildlife Act 1974 this Service has a responsibility and obligation to the people of NSW to protect native fauna. Our native eagles are beautiful and majestic birds which have a unique place in the Australian environment. For more information on the activities of the service, or to get visitor information about the National Parks and Reserves in the region, contact NSW National Parks and Wildlife Service at Alstonville on telephone (02) 66 27 0200, or visit their website.